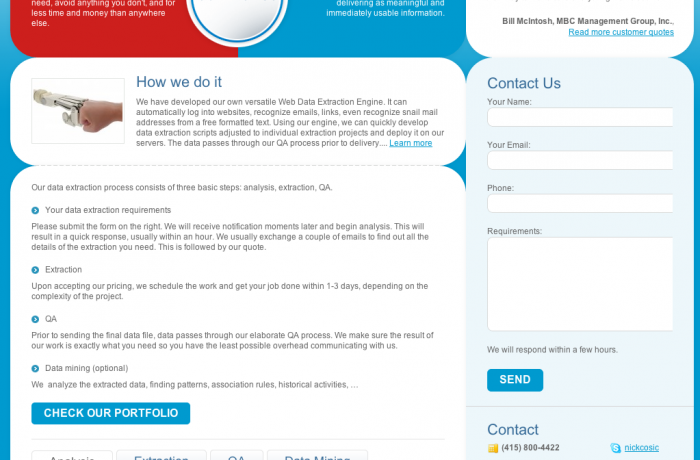 We are providing web data extraction services for more than 50 clients. Our data extraction process consists of three basic steps: analysis, extraction, QA. Please submit the form on the right. We will receive notification moments later and begin analysis. This will result in a quick response, usually within an hour. We usually exchange a couple of emails to find out all the details of the extraction you need. This is followed by our quote. Upon accepting our pricing, we schedule the work and get your job done within 1-3 days, depending on the complexity of the project. Prior to sending the final data file, data passes through our elaborate QA process. We make sure the result of our work is exactly what you need so you have the least possible overhead communicating with us.